Thomas Bulla, a U.S. Marine Corps Veteran, says he did a lot of soul searching earlier this year and realized he needed to save himself. He was in his 60s, on several medications, in pain and tipping the scale at 313 pounds. Bulla says reaching his turning point had a lot to do with age. Bulla looked for assistance at the Salisbury VA Medical Center where he receives care. He began seeing a VA dietitian and wanted to participate in the facility’s MOVE! Weight Management program, but it quickly became clear that he could not make the hour-long drive every day. That’s when his dietitian referred him to their TeleMOVE! program instead. TeleMOVE! is one of VA’s Home Telehealth Services in which Veterans are matched with a VA Care Coordinator and at-home health monitoring technologies that best fit their needs. It is a 90-day program that focuses on nutrition, physical activity and behavior change. In 2018 alone, more than 136,000 Veterans were enrolled in VA Home Telehealth. Currently, there are approximately 75,000 participating daily and about 9,000 of those are enrolled in the TeleMOVE! Program. Mr. Bulla met the program criteria and was paired with Salisbury TeleMOVE! Care Coordinator, Rebecca Veros, RN, BSN. Some TeleMOVE! Veterans have Registered Dieticians as their Care Coordinator. The national MOVE! program office and the Home Telehealth program under the national Telehealth Services program office collaborate regularly to ensure the MOVE program is delivering consistent content across the various MOVE! programs in VA.
SMART goals, to be exact. One of the first tasks in getting started with VA’s TeleMOVE! Program is to set goals that are Specific, Measurable, Action-oriented, Realistic and Time-based, or SMART for short. For instance, if you want to cut calories, one goal might be to reduce the number of soft drinks consumed weekly from seven to three over a period of one month. Next, Bulla and Veros discussed which telehealth technologies would work best for him. In addition to the TeleMOVE! program’s daily sessions on diet and exercise, Veterans answer questions and report weight, pulse, blood pressure, glucose or other metrics each day depending on each Veteran’s specific need and assigned by their Care Coordinator to monitor their progress and their health status. Stephanie Burleson, Home Telehealth Lead Coordinator at Salisbury, explains that there are a wide variety of home telehealth technology options and Disease Management Protocols depending on a Veteran’s health needs, type of connectivity ,and what they may or may not already have in their home (e.g., scale, blood pressure machine). Four reporting options are available: by mobile app, telephone, a secure internet website, video technology or a home hub device. Veterans also often use My HealtheVet’s Secure Messaging to send non-urgent questions or comments to their Care Coordinator and other members of their health care team. Additionally, all reporting methods include an alert system – green, yellow and red – that helps guide Care Coordinators For example, Ms. Burleson shared that the system did alert another Veteran’s Care Coordinator in regard to a response to a question. The Care Coordinator called the Veteran and got more information and directed the Veteran to go the nearest emergency department where they discovered four blockages. He underwent bypass surgery two days later. After his pre-dawn check-in, Bulla follows the program’s daily lessons and has established various exercise routines for himself, depending on the day. “I mean, it’s called MOVE! for a reason. If you don’t move, you’re not going to reach your goals. Exercise has to be something you do every day, like breathing,” he says. In the beginning, Bulla says he pushed himself to walk a mile. Now he walks 5 miles every day, still attends fitness classes at the medical center twice a week and has recently added strength training. 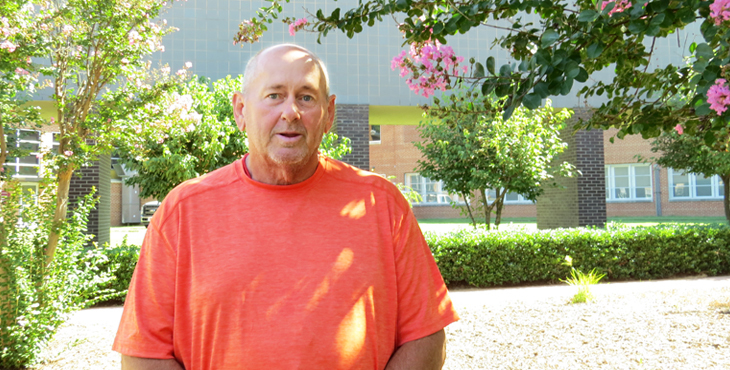 After two 90-day program cycles, Mr. Bulla has lost 69 pounds. He’s aiming to double that amount in the coming months. If you’d like to participate in the TeleMOVE! or MOVE! program, talk to your VA primary care provider to learn what options are available in your area. A self-guided version of the MOVE! program is also offered as a mobile app, available for both iOS and Android devices, on the VA App Store.